Welcome to High-Adventure Week on Bryan on Scouting! Our annual celebration of the BSA’s four national high-adventure bases is now in its fifth year! Here’s a look at why, how and when to secure a spot for your Scouts. Take a hike at Philmont Scout Ranch, and discover that you’re even tougher than you think. After Philmont’s 2018 treks were canceled because of fires in the backcountry, the home of the original mountaintop Scouting experience will be back and better than ever in 2019, 2020 and beyond. The base is best known for seven- and 12-day treks that challenge participants mentally and physically. Treks include stops at several of Philmont’s staffed backcountry camps, where staffers, many dressed in character, offer experiences participants will remember all their lives. Individual opportunities are available at Philmont, too. Choose from a STEM trek, the Roving Outdoor Conservation School, a Trail Crew Trek and more. You can also bring the whole family to the Philmont Training Center for a weeklong conference or the new Philmont Family Adventure program, which was so popular in 2018 that the ranch is adding two more weeks in 2019. Here’s what else you need to know about planning a trip to this legendary Scouting destination. Philmont participants learn from Rangers who can help them know what to look for in the backcountry. Photo by Lex Selig. Philmont’s about more than just treks, but treks remain the ranch’s most popular offering. For many departure dates, demand exceeds supply. That’s why Philmont offers an online lottery, held about 18 months in advance, to give everyone an equal shot. 2019 treks: The online lottery for 2019 slots was completed in December 2017. You can check for openings here, but they’re very limited. Another option for Scouts wanting to take a trek in 2019 is to check with their local council. Many councils have contingent crews that may have an opening. 2020 treks: Slots in 2020 will be allocated through an online lottery. The 2020 lottery window is open Oct. 30 to Dec. 2, 2018. The lottery-based registration process gives everyone an equal chance at some of Philmont’s most popular departure dates. Register during the lottery window to give your crew the best chance at the date you want. Go here to enter the lottery or learn more about the process. The 2018 Philmont fire. Photo by Thomas Mejia. At the Philmont Training Center, more than 6,000 Scouters and family members attend a conference each year. 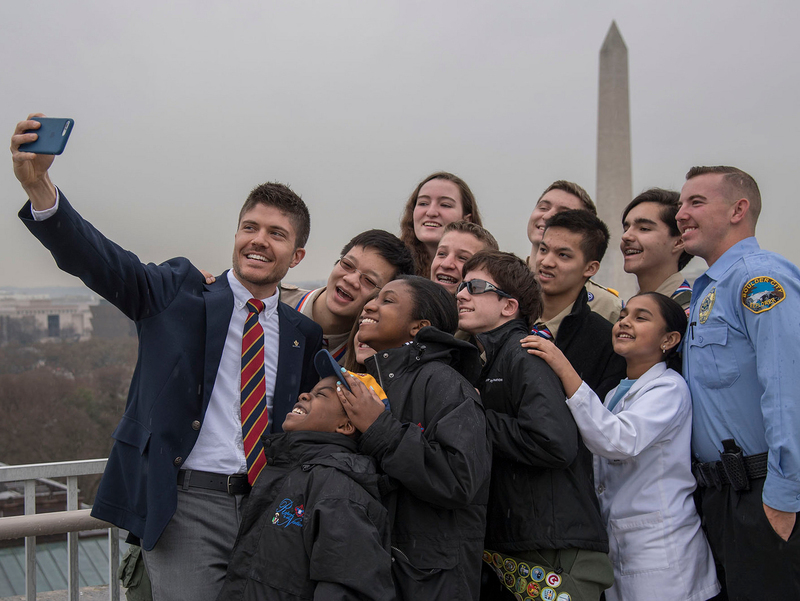 In one of the best settings imaginable, they learn about the latest Scouting tools and techniques, share ideas with fellow Scouters, and interact with experienced faculty members. All registered Scouters can attend training center courses (and bring the whole family with them). Council approval is not required. PTC will offer more than 50 courses in summer 2019 to help you strengthen your Scouting skills. Browse the offerings at this link. Philmont Family Adventure, where everyone in your household can experience the magic of Philmont together, debuted in 2018. The experience was so popular that Philmont has doubled the number of available weeks in 2019 to four. This means that even more families will experience the ultimate summer vacation. They’ll hike or ride horses, craft or climb, explore or simply enjoy an ice cream cone at the cantina — all as a family. Searching for a great summer job? Philmont is hiring. Photo by Andrew Avitt. If you’re registered for a 2019 Philmont trek, look for Itineraries to be available in January. They call it “the Second Season,” and it’s a reminder that Philmont is open all year long. Learn more about Philmont’s fall and winter programs at this link. Philmont will send you free promotional materials. Get the scoop on how to get handouts, banners and brochures here. Looking for gear? Going on a trek? Simply missing Philmont? Check out the Tooth of Time Traders for amazing gear and souvenirs. It’s open 24 hours a day, 365 days a year at ToothofTimeTraders.com. Philmont has begun hiring staff for the 2019 summer season. Apply for one of these paid positions at this link. Get your Philmont music fix by listening to this playlist on repeat. Philmont is now home to the National Scouting Museum. Plan your visit here. If you visited Philmont in 1966 or later, your photo’s in the Philmont Photo Archive.